Since 1968 Prestige Autowash & Automotive has been a family owned and operated automotive and car wash center with one mission – provide quality service that makes our customers feel good. This year marks our 50th Anniversary and as a thank you and to show our gratitude with the endless support we will be throwing a fundraiser on Saturday November 17th from 8am-5 pm. 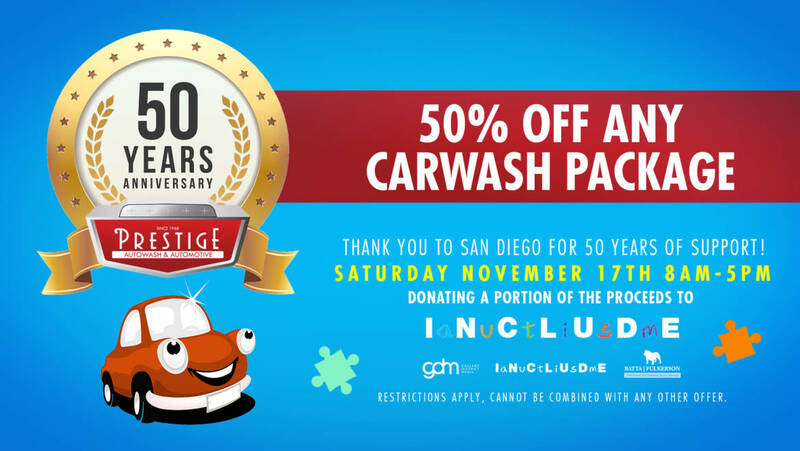 We have partnered with the amazing nonprofit organization, Include Autism to offer 50% off all car wash packages, with a portion of the proceeds benefiting their incredible cause. We will be doing raffles throughout the day giving away carwash packages, detailing packages, and more! We also are offering donations on our facebook page if people aren’t able to attend. Include Autism is a not-for-profit, organization dedicated to providing services that instill community-wide autism inclusion. Their focal program, Community Coaching program provides natural, hands-on opportunities for our program participants to develop adaptive, functional skills needed to become included in their community. Include Autism also has Autism Inclusion Training for businesses and community organizations, Volunteer, Peer Pal and Inclusion Baseball League programs. April Giveaway: SUPER WORKS Auto Detailing Package! We are a San Diego Car Wash located in the 92111 Convoy/Kearny Mesa area. 92101, 92123, 92109, 92115, 92108, 92122, 92124, 92119, 92103 zip codes are all surrounding us. 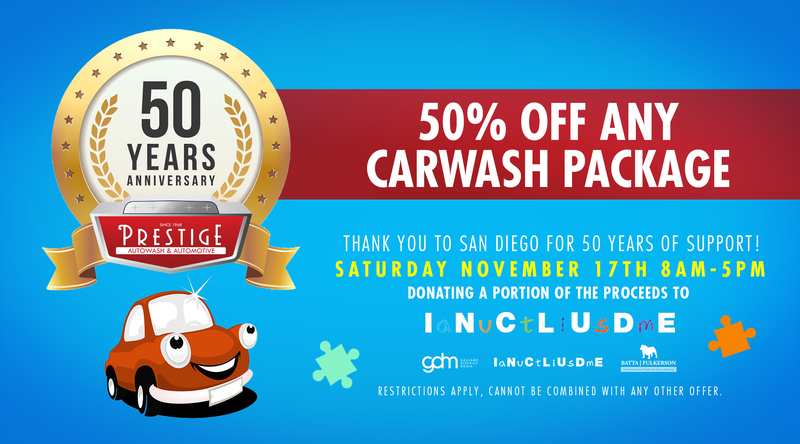 Prestige Autowash and Automotive is the #1 Car Wash and Auto Repair Center in San Diego, CA. Our complete line of in-house services include full car wash, auto detailing, auto repair, oil changes, car smog, and car maintenance. We were recently rated Best Car Wash, Best Detailing, and Best Auto Repair in San Diego! Enter for special offers, discounts, and FREE car washes. © 2017 Prestige Autowash & Automotive. All rights reserved.